Karen Parker is a molecular biologist with a decidedly artistic side. Her life-long love of fiber arts eventually led her to embellishing fabric with beads and then to bead weaving. 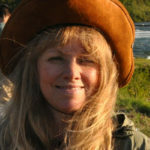 But she longed to create something that connected her to nature in the same way her research does. In Karen’s own words, “A chance encounter with a microscopic image of butterfly wing scales was a turning point [because] they so closely resembled the seed beads in my stash!” She decided to create realistic beaded butterflies, mimicking their coloring and accurately reproducing their dimensions. And the result is truly stunning! According to Karen, brick stitch is perfect for creating her butterflies. 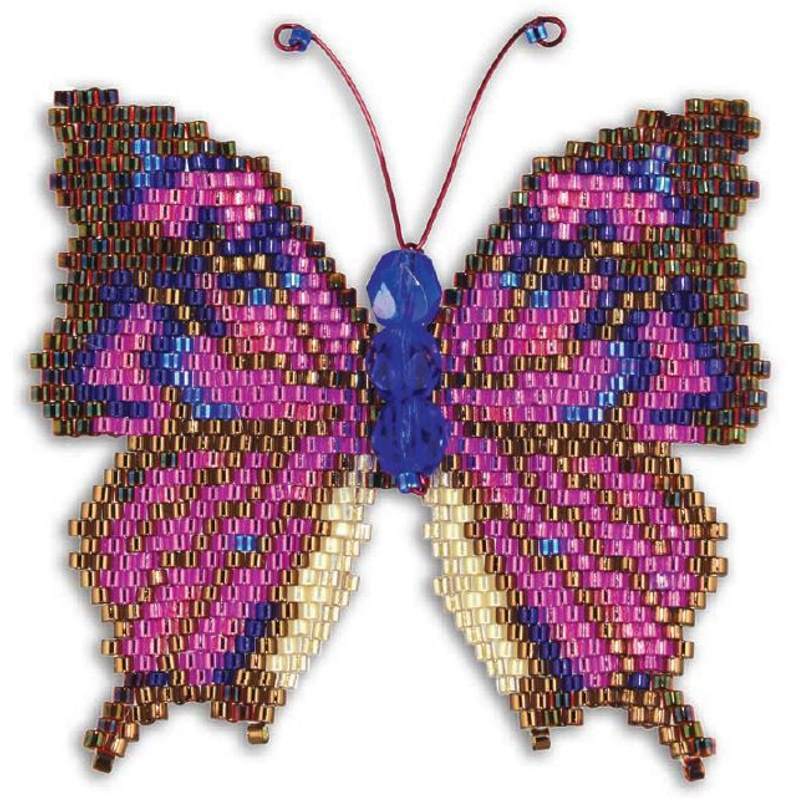 She says, “Brick stitch is ideal for creating the irregular edges of butterfly wings.” In addition, “brick stitch makes a firmer piece than peyote stitch does.” Karen says that she specifically taught herself brick stitch so that she could stitch beaded butterflies. 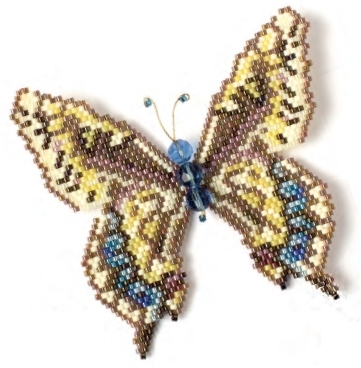 To create each beaded butterfly, Karen starts with a detailed pattern. She tried using graph paper and colored pencils at first, but she disliked having to start over every time she wanted to change the details. Karen decided to use Microsoft Excel to graph each pattern. 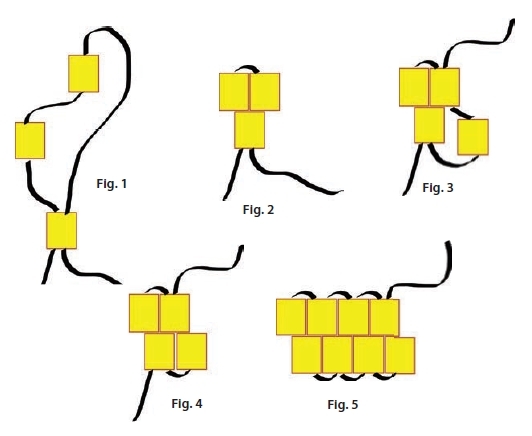 She merges and outlines cells to create a brick-stitch graph. This method allows her to click on each cell to color it in. 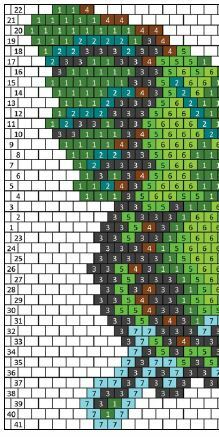 Using Excel lets Karen save multiple variations of each pattern. In addition, she can easily export her graphic files to PDFs. 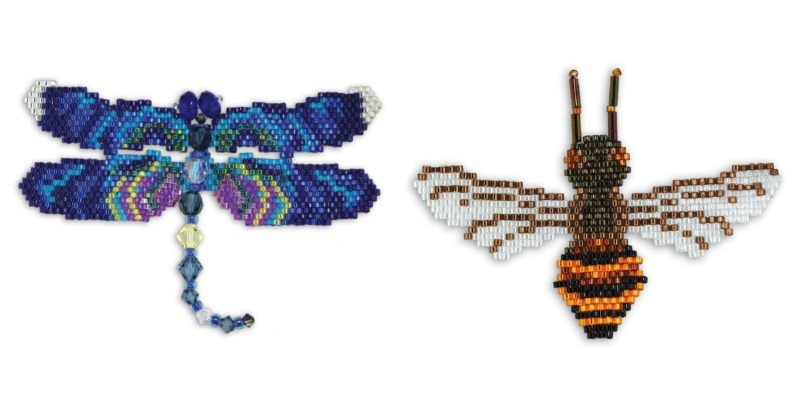 In addition to all the varieties of butterflies Karen makes, she also beads other winged creatures such as dragonflies and honeybees. Aren’t they the cutest?! 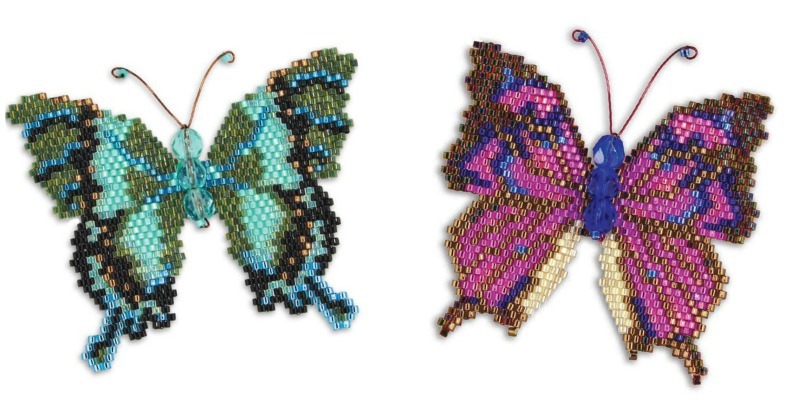 Karen’s eBook, Brick-Stitching Nature: Charts for Beaded Butterflies, Dragonflies, and a Honeybee, includes a brick-stitch primer, basic instructions for stitching a butterfly, and patterns for 6 different varieties of butterflies — plus instructions for 2 dragonflies and a honeybee! In addition, it offers finishing instructions for stitching a spiral rope to turn your beaded creatures into lovely pendants. For more of Karen’s designs, visit her Etsy shop, Wizard Island Designs. For more nature inspired designs, check out these titles.